Located just a 25-minute drive from the Parc des Princes Football Stadium, Arioso offers a lounge bar and elegant guestrooms with free WiFi. Miromesnil Metro Station is located a 3-minute walk away and offers direct access to both Parc des Princes and the Stade de France Stadium. Decorated with luxurious wallpaper and fabrics, guestrooms at the Arioso are air-conditioned and feature a flat-screen TV with international satellite channels. Some rooms offer a balcony or a seating area. Breakfast is served each morning in the hotel’s breakfast room, or in guests’ rooms upon request. In the evening guests are invited to relax in the hotel’s lounge bar with a fireplace or in the courtyard garden when the weather is nice. The hotel offers a reservation service for excursions and staff are available 24 hours a day. Additional services available include dry-cleaning and ironing available upon request. Metro Station Saint-Augustin is located 350 metres from the hotel and offers direct access to The Eiffel Tower. 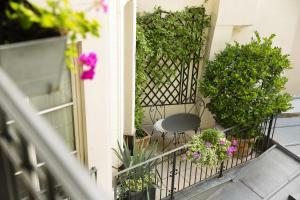 Parc Monceau is a 10-minute walk away. In case of non-refundable bookings, please note that you will be asked for the credit card used to make the reservation upon check-in. Located on the ground floor, this room features a view of the hotel's patio. Satellite TV, a minibar and free Wi-Fi access are provided in this en suite room. Rate: € 149.00 ... € 407.00; select dates below to get current rates. Some rooms are more spacious and include a sofa and a coffee table, while others are a little less spacious and features a 5m² private balcony. Rate: € 249.70 ... € 321.75; select dates below to get current rates. Rate: € 253.03 ... € 325.42; select dates below to get current rates. Composed of 2 communicating rooms, which are accessed by a private corridor. There are 2 individual bathrooms. Different bed configurations are possible upon request.